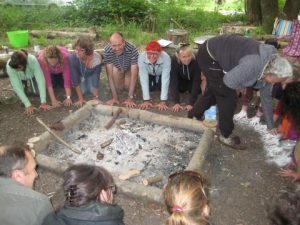 Recently I attended an inspiring Wildness and Wellbeing summer seminar at Young Wood near Taunton. It was a great opportunity to share experience, explore good practice and find new ways of connecting with nature to enhance wellbeing. Upon starting the seminar, I immediately felt more relaxed and nourished from being in the woods. We sat in a circle around a fire hearing from a number of speakers, a welcome change from being in a room with a white board. Here, all my senses were heightened: the sound of birds, the smell of the fire, the backdrop of the beautiful trees, all sipping our hot drinks heated on the fire. 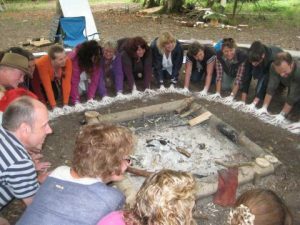 It was an immersive experience: connecting with others while being lead on a walk in the woods, trying natural dye work, learning to light a fire with flint and sharing an amazing feast together produced by Tracebridge Fermenteria. In the morning we heard from Dave Topham from Mind West Somerset who has been facilitating groups of people with mental health problems at Young Wood. He has been taking groups of ten people into the woods to carry out conservation work, create a fire and make and eat food together. All of this has had noticeable improvements on participants’ wellbeing. Using the Edinburgh Wellbeing Scale, Dave found that participants’ confidence increased by an average of 45%, their mood improved by an average of 35% and some people even reported that their whole life had turned around. In the group, 70% of the participants were men, a group that traditional services find hard to reach. Dave’s key message was to help people get out to the woods with no pressure to join in, and to simply “let nature do the healing”. The next speaker, Ian Blackwell, shared best practice and lessons learned from two projects which he has worked on. The first was Dangerous Dads, an outdoors practical activity project open to dads with their young children, and intending to support the father-child relationship. (This is a project which our Totnes Wellbeing Fund has supported with a grant). Ian noticed that being outdoors doing physical activities gave those fathers involved an opportunity to share more than they would sitting in a room. Through sharing, these men received lots of useful peer support and this helped them to realise they are not alone in facing the issues and challenges involved in being a dad. 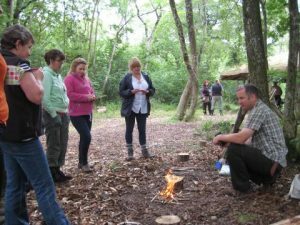 The hosts of this event were an inspiring social enterprise called, Neroche Woodlanders, who often run focused sessions for a range of people and have had great success in promoting wellbeing through the simple structures of conservation work, bush craft, creating food and sharing. 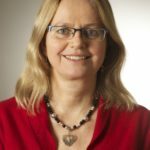 Keen to read more posts like this? Check out the environment section of our blog. To stay updated on our latest wellbeing blog posts, you can follow us on Twitter and Facebook.